Skin and ear diseases are very common in pets, especially in our hot and humid Florida climate. They are grouped together because the majority of ear problems are actually caused by dermatologic disease. The pets here in Pam Harbor may be affected by a variety of external parasites and infections (bacterial and fungal) and allergies of various types are rampant. Veterinary dermatology in Florida is quite complex and skin problems are much more common in animals than people. Itchy and inflamed skin tends to look much the same regardless of the cause, so understanding dermatology is critical to managing these acute and chronic skin problems. 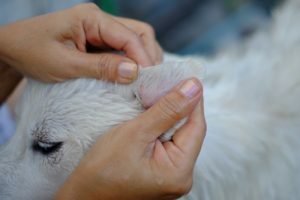 Fortunately, Dr. Baird has years of experience treating animals with skin and ear disease in this climate. Dr. Baird and her associates have extensive training in the diagnosis and management of skin and ear disorders. With careful examination and understanding of the pet’s history, the skin and ear problems can be evaluated and diagnosed through appropriate and judicious testing as indicated by the specific symptoms. This permits an accurate diagnosis to act as a foundation for appropriate treatment and an end to itchy, miserable skin disease. Dr. Baird continues to dedicate many of her post-graduate training hours to dermatology every year as these problems pose many challenges to the welfare of our pets. Thankfully, there are new treatments evolving in recent years, providing us with more treatment options to provide relief from miserable itchy, inflamed skin and ears. Returning your pet to more comfortable, healthy skin and coat is our top priority.